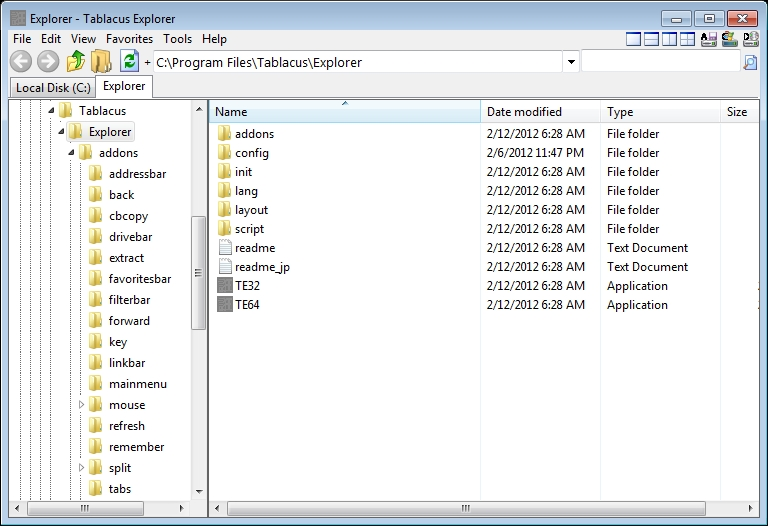 Tablacus Explorer is a file manager with lots of features, including tabs, completely customisable menus and interface, mouse gesture support, and optional addons. The program is portable and extremely small (1.13MB), yet still manages to squeeze in both 32 and 64-bit editions. Tabs can be created with a keypress, or managed by right-clicking an existing tab (there are all the usual open, close and lock options). Files can be dragged and dropped from one tab to another; and once you've spotted the tiny icons in the top-right corner, you'll also be able to switch between a 1, 2 or 4-pane interface, each of which can have as many tabs as you need. The program doesn't always behave as you expect. We clicked the Help menu, for example, and found it mostly contained a list of folder names, like "Documents" or "Start Menu". These acted like shortcuts, and selecting one opened that folder in the main interface. Okay, that's perhaps useful, but why list these under "Help"? Especially when there's already a system for "Favourites"? There's also little in the way of documentation. Tablacus Explorer has plenty of options and settings, but figuring out exactly what they might do is a real challenge. If you only want a portable tabbed file manager then maybe none of this will matter too much. All you have to do is choose your preferred pane layout and you can simply ignore everything else. If you're actually hoping to use the more advanced features, though, be prepared to spend quite some time to explore, because the program is far from straightforward. Tablacus Explorer is fine for simple tabbed browsing, but a horrible configuration interface and total lack of documentation mean its more advanced features are very hard to figure out. This currently looks like the most frequently updated freeware program in history, and always for "minor bugs". Makes you wonder how many were in there originally.